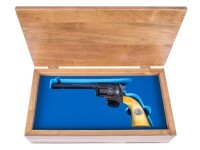 *Shootist Limited Edition Hand-Engraved Peacemaker pistols numbered 1 through 100. 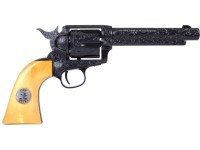 In recognition of the timeless appeal of the Colt SAA and in admiration for John Wayne as a symbol of American gun culture, this Shootist limited edition Duke Colt Single Action CO2 Pellet Revolver is a faithful replica of the classic six-shooter. This gun is yet another American treasure created to honor the traditions of the Old West and to celebrate the 40th Anniversary of the classic John Wayne picture, The Shootist. 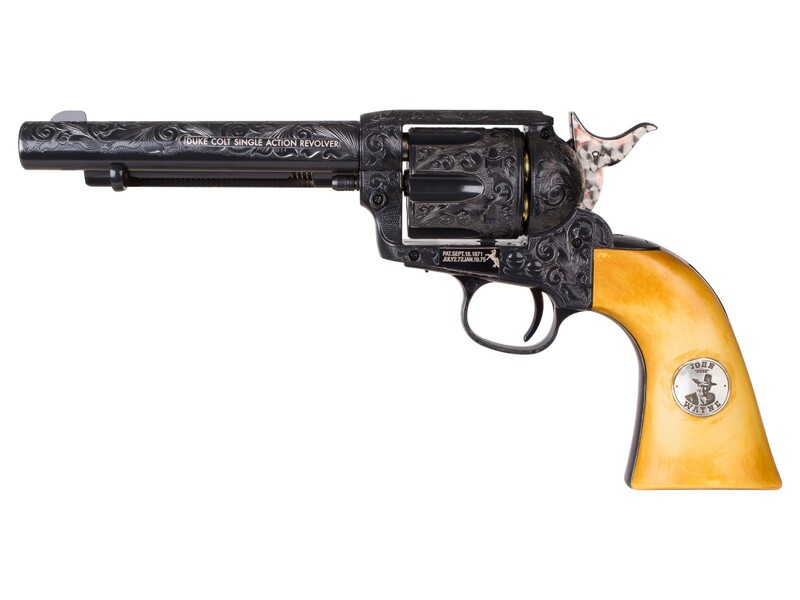 This Shootist limited edition model has been kicked up a notch with magnificent hand engraving from Conrad Anderson of Rocktree Ranch Enterprises. Only 100 made! Rocktree Ranch has produced exact reproductions of the famous silversmiths of early 20th century Hollywood by creating special dies and molds that produce virtually any of the famous signature silver worn by favorite Western stars/characters Roy Rogers, Hopalong Cassidy, The Lone Ranger, Gene Autry, Shane, Tim McCoy, Ken Maynard, Paladin, Matt Dillon and The Virginian. Silver screen gunslinger John Wayne is one of the most iconic figures in American culture and the Duke Colt Single Action Army (SAA) revolver he carried remains among the most popular reproductions. As J.B. Brooks in his final film role for The Shootist, the Oscar-winner carried his trusted Peacemaker. Together, the Duke and his six-gun captured imaginations and personified the Old West. Be one of only 100 fortunate collectors and add it to your collection today. 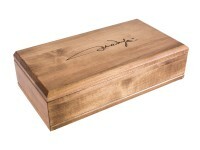 You'll be proud to display it in the beautiful commemorative case! 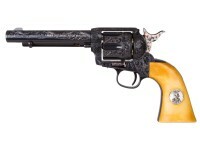 The CO2 revolver shoots .177 caliber pellets, features authentic action, a full metal frame, blued finish, and handsome, composite ivory grip panels that include an inlaid medallion detail of the Duke himself. John Wayne's signature is on the back strap of this collector's gun. The single action revolver is powered by CO2, and the 6-round cylinder has a working ejector rod for added realism and convenience. To remove an empty shell, open the loading gate, pull back the hammer to half-cocked and push on the ejector rod. Speedloaders don't work on this gun because the shells are inserted by hand one at a time. To load BBs in the shells, insert one steel BB in the bottom of each. Things I liked: This gun is all about the engraving, making it a thing of beauty. The display case is also done very nicely. But beauty can be only skin deep....read on. Things I would have changed: Sadly, I returned mine because the "blued" finish was flaking off edges and in the cylinder bores to the touch of a silicone cloth or clean patch. I can deal with the labels on the barrel, the medallion on the grip, and the solid color of the grips, but not that finish. IF AND WHEN this gun gets a REAL gun blue finish, I'm there. What others should know: If your plan is display only, knock yourself out. But as for me, I'd like a more durable gun blue finish on something I want to handle and shoot. Things I liked: Great Duke Revolver! A must have for any John Wayne Fan. Beautiful engraving, definitely a show piece. Things I liked: Engraving is fairly well done. 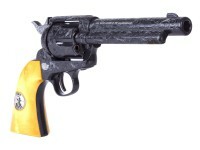 There isn't any of that "This is not a toy .......Can result in injury or death" legalize on the revolver. Things I would have changed: The medallions on the grips make them cheap looking. Also, the staining of the grips is nowhere near as dark as pictured. They are basically an off-white, with no orange noticeable. I put on a pair of grips from a Colt BB pistol that I stained to look like the grips on John Wayne's Colts and now the revolver looks more realistic. What others should know: I normally don't "nit pick" in my reviews, but for $500 I was expecting higher quality. First, the engraved area of the pistol is covered with lacquer (I hope it isn't black paint), presumably to protect it during handling (high grade engraved shotguns have the same treatment). Second, the back strap and bottom of the grip are not lacquered, resulting in a noticeable difference. Third, the back strap above the John Wayne signature had noticeable thinning of the bluing. Lastly, on the bottom of the grip the metal was scratched and devoid of any bluing. Not the quality I expected. I am a huge John Wayne fan and waited 14 months for this pistol so I'm not returning it. I'll blue the grip metal and maybe lacquer it. I have not shot the pistol, but assume it will have the same accuracy as my weathered John Wayne pellet gun. Umarex thinks these medallions look great , I think all of these medallions are incorrectly done . They should use correct sized Colt medallions where they are usually placed in the upper grip just below the upper portion, and use screws take a correct two piece grip. There are techniques to chemically case color alloy frames as well as a more durable bluing. Are the imitation tea-stained grips available for separate purchase? I love their look. How is it that you offer brass colored pellet casings for this particular SAA model but not for the other pellet models of the single action army??? I want brass casings for mine! The brass colored cartridges are for BBs. The silver colored cartridges are for pellets. Are these numbered... as in 1 of 100?